There’s a natural cycle to niche blogs that make it big. They start out niche, they attract more users, and the topics slowly migrate to the more general. Then, sometime in the future, it becomes a repository of pet-related animated gifs. I’m not even saying this is a bad thing (except maybe the news category). I actually prefer the (slightly) larger scope of TOP TIER technical commentary, tips/tricks/tutorials, lessons learned, etc. The problem isn’t what Hacker News is now—it’s what it’s likely going to become in the phase after this. We need to figure out how to stop the “progress” towards a larger audience that wants more general tech news and cat pictures. Keep in mind we have a specific feel here at the site. Try to keep it within these lines if you can. This would simply be a way of self-regulating during the submission phase. We could have this both on the submit screen and on the “mark as off-topic” button on links. And perhaps it could only be available for accounts of a certain age, or a certain contribution ratio, or something. 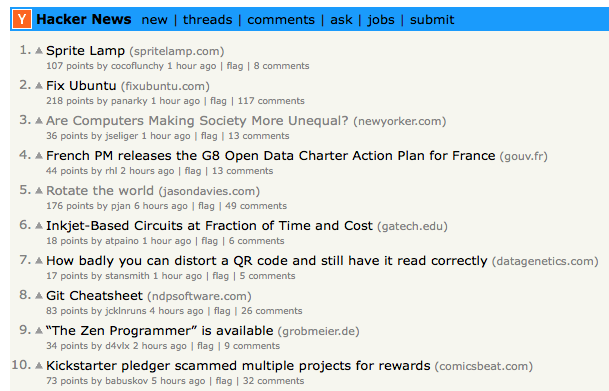 I’m curious to hear any other thoughts on how to keep Hacker News what it is.